April 14 – Genevieve R. Bonnot, 30, of Columbia, was arrested for DUI and driving while license revoked at 701 Old State Route 3. Christopher M. Messer-smith, 41, of East Carondelet, was arrested on an in-state warrant on Palmer Road at Route 3. April 15 – Krista M. Hill, 25, of Collinsville, was charged with retail theft following a Feb. 12 incident at Dollar General. Charles A. Cannon, 59, of Centreville, was arrested on two St. Clair County warrants on I-255 at the JB Bridge. April 17 – Tyshoneil M. Sykes, 37, of St. Louis, was arrested for possession of cannabis, driving while license suspended and speeding on I-255. April 20 – Ronnie O. Stumpf, 34, of St. Louis, was arrested for DUI, improper lane usage and failure to signal. April 15 – Christopher Wetherall, 29, of Red Bud, was arrested for DUI and driving too fast for conditions after his pickup truck went into a ditch off LL Road. Several more cases of identity theft related to “e-file” online tax filings and social security numbers being used unlawfully were reported. April 16 – he theft of a 1942 Allis Chalmers tractor from a property in the area of 2700 Hanover Road is under investigation. The theft occurred sometime over the past two months. April 19 – The reported theft of 10 to 15 bags of aluminum cans from the basement of a home in the area of 5900 M Road is under investigation. April 20 – Lewis Harris, 59, of Columbia, has been charged with battery following an incident at 1576 Hilltop Road. April 16 – Jennifer N. Langston, 30, of Waterloo, was arrested for possession of cannabis and possession of drug paraphernalia at Park Street and S. Church Street. April 18 – Mark Schaeffer, 20, of Waterloo, was arrested for possession of a controlled substance (hydrocodone), DUI, illegal transportation of alcohol and failure to reduce speed to avoid an accident on Washington Street at Rogers Street. 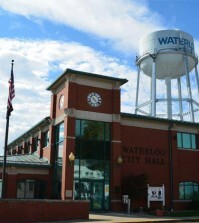 April 19 – Dianne Stevenson, 52, of Waterloo, was arrested for battery at 418 W. Fourth Street. April 20 – Derek M. Miller, 28, of Red Bud, was arrested for DUI (drugs), possession of drug paraphernalia, no insurance and improper lane usage on Route 3 at HH Road.